Obesity is increasing rapidly throughout the world, and is predicted to double by 2025. Bariatric surgery has shown promising results, but a need for a safe and more effective procedure exists. 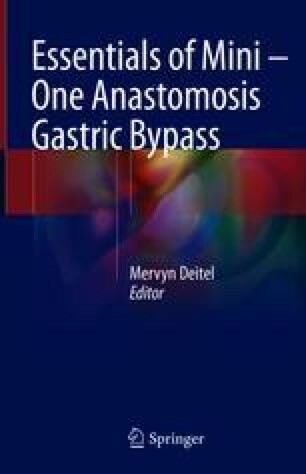 In the last decade, there have been many publications confirming that Mini-Gastric Bypass (MGB) is a safer and equally or more effective alternative to the traditional Roux-en-Y gastric bypass. MGB has shown stronger metabolic control and more durable weight loss than the traditional bariatric operations. The proposed mechanism behind this sustained weight loss and effective control of the metabolic syndrome is a longer biliopancreatic limb and the long gastric pouch with a wide gastric outlet, giving a low-pressure tube and thus reducing the chances of leak, nausea, and reflux in the immediate post-operative period. There are also fewer chances of dilatation in the long-term for the same reason. The delivery of food without obstruction enables the food to be dropped into the distal jejunum, thus causing a transient dilatation of the gut and thereby giving a feeling of satiety. This mechanism may be called “non-obstructive restriction of the MGB.” Other mechanisms working behind the MGB are the gut hormones, incretins, and changes in the gut flora. Although initially there was strong skepticism of the MGB, now the safety, durability, and reversibility of the MGB is well accepted. With this comes the understanding of the special mechanisms, justifying the multiple published good results of MGB. WHO Factsheet. Obesity and overweight. 2017. http://www.who.int/mediacentre/factsheets/fs311/en/. Deitel M, Kular KS, Musella M, Carbajo M, Luque-de-Leon E. A new organisation – The MGB/OAGB Club. Bariatic News. 2015. http://www.bariatricnews.net/?q=node/2159.